Grass carp (Ctenopharyngodon idella), also called the white amur, are plant-eating fish first introduced to the United States in 1963. They are used to control submerged aquatic plants, which if left unchecked may reduce water circulation in ponds, stunt fish growth, get tangled in fishing lines and interfere with swimming. Depending on your location, you may be able to purchase fish locally. Some dealers sell over the Internet and ship to other states. Check first with your state's fish and game department about what regulations apply in your jurisdiction; they may also be able to point you to local dealers. What Is a Grass Carp? Grass carp are native to the eastern parts of Asia in rivers that flow to the Pacific Ocean. 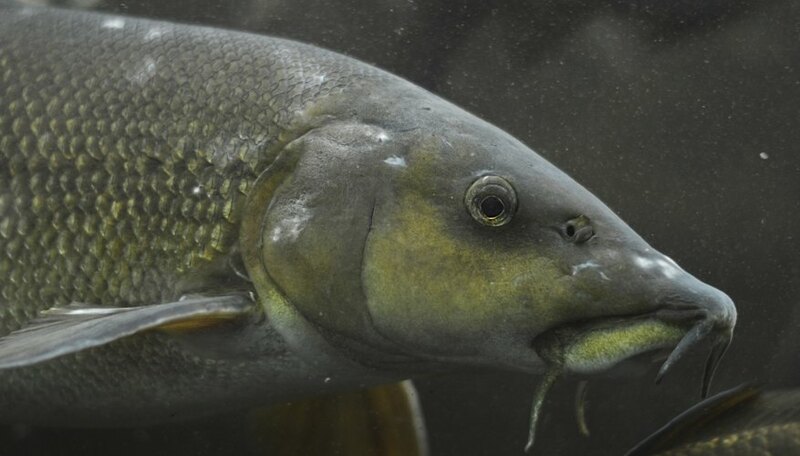 To prevent grass carp from reproducing and becoming invasive, most sold in the United States are made sterile by shocking the eggs to create a triploid fish with an extra chromosome. Be sure to check local regulations before buying grass carp. Some states, such as Michigan, do not allow introduction of grass carp at all. Other states, including Ohio and New York, only allow the sterile varieties and typically require a permit. The number of grass carp needed for a specific pond is affected by how large the pond is and how much of the pond is covered by plants. Stocking rates vary between five to 15 fish per acre, based on density of plant growth. Five fish per acre will work for ponds with few plants, and 10 to 15 fish per acre can be stocked for medium to high plant density. It is better to stock too few fish than too many. More fish can be added after two or three years if plants still cover more than 20 to 30 percent of the pond. Most grass carp are sold when they are between 8 and 12 inches in length. If predators such as snakes, large fish, herons and other water birds are present, be sure to stock grass carp that are at least 12 inches or weigh 1 pound or more. Fish this size eat constantly, but it may take three to four years before they are large enough to keep a pond clean. Resist the urge to add extra carp when small to get the plant growth under control more quickly. Grass carp can weigh between 30 and 40 pounds when mature, and should not be overstocked. To minimize stress to the fish, stock on a day when the water temperature is less than 65 degrees Fahrenheit. Avoid temperature changes between the pond and transport water by floating the fish container in the pond for a few hours before releasing the fish. To make sure the carp stay in the pond, install grates over overflow pipes and spillways. Grass carp will follow moving water and leave the pond if they can. Containing grass carp in the pond may be a condition of permits to stock grass carp.